Yesterday (Sept. 21, 2014), a 129-year-old building — one of the oldest buildings still standing downtown — built in 1885! — was demolished. Today it’s a pile of rubble. Yeah, I don’t understand it, either. Dallas has a real problem with preserving its history. In the 1909 photo above, it is the one at the right, behind the three men in white shirts who are standing above the crowd. And now it’s gone. And so is the Praetorian, the tall white building on the corner of Main and Stone. Maybe someone should make sure the Wilson Building has armed guards on 24-hour wrecking-ball watch. 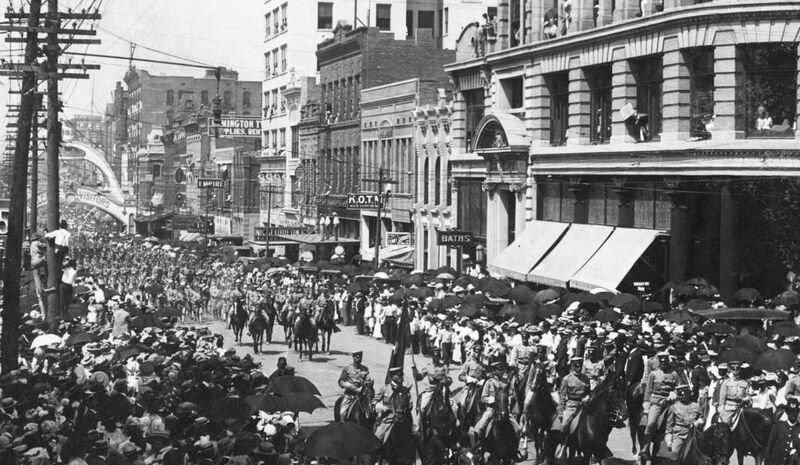 Photo is a detail from “Parade Day, Military Tournament, Dallas, Texas” by Clogenson (1909), from the collection of the DeGolyer Library, Central University Libraries, Southern Methodist University. It can be viewed here. The original photograph is the subject of a previous post, “Parade Day — 1909” which can be viewed here. A Dallas Morning News article by Robert Wilonsky on the surprise demolition of 1611 Main Street (which, until 1911, was actually 369-371 Main Street) can be read here. Tearing down the history of the city. Very sad indeed. And it just keeps happening. I think that most Texans now have only been here maybe two generations and don’t have any emotional connection to the city. You are wrong, Rick Mitchell. There are plenty of native Texans still there. I can’t explain why they let things like this happen. Maybe it’s because the decision makers don’t have long term connections. It grieves the heart a true Texans, I can assure you.